Below is a schematic representation of the Murtoa to Hopetoun railway line - which sees an almost daily return mineral sands train service between Hopetoun and Hamilton. Trains have once again begun to move on the grain only branches in western Victoria after a couple of months of little action. The Iluka mineral sands trains have continued to run between Hopetoun and Hamilton with a single BL class locomotive the most common motive power. 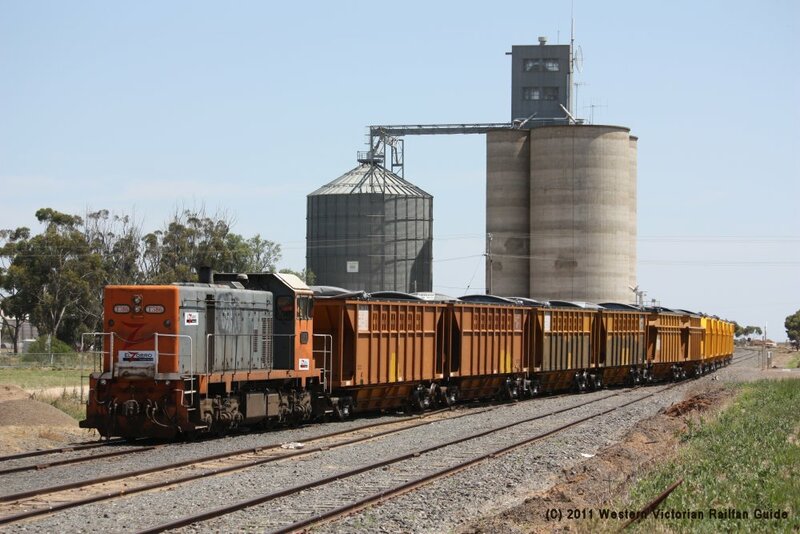 A grain train that ran to Hopetoun on Fri.7.Aug encountered some problems. The train consisted of locomotives BL26-BL27 with 46 hoppers and the loading of the grain was not completed on Friday so the train was parked in the yard overnight. On Saturday afternoon loading was completed and the train departed at 15:50. Our correspondent followed the train down the highway shortly afterwards and discovered that it had come to a standstill on the second rise on the track about 5 kilometres from Hopetoun. It is not known if the train stalled or if there was a problem with one of the locomotives. After a long delay the train was eventually reversed back to the Hopetoun yard where it was stabled overnight after arriving at 18:00. On the afternoon of Sun.9.8.2015 light locomotive G520 arrived in the yard and was attached to the BL locos and the train departed Hopetoun at 15:40. This was a very rare occurrence of a triple headed train on this branch. 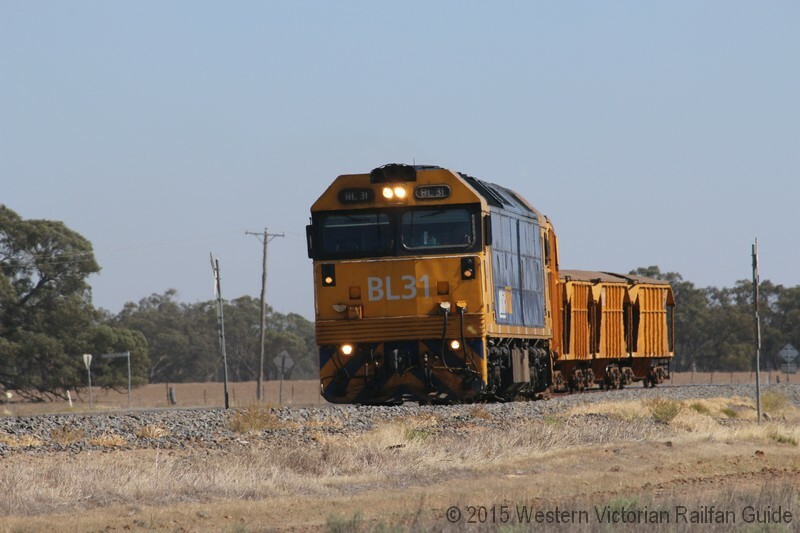 Locomotive BL31 assisting the loading of a mineral sands train at Hopetoun on Fri.27.3.2015. 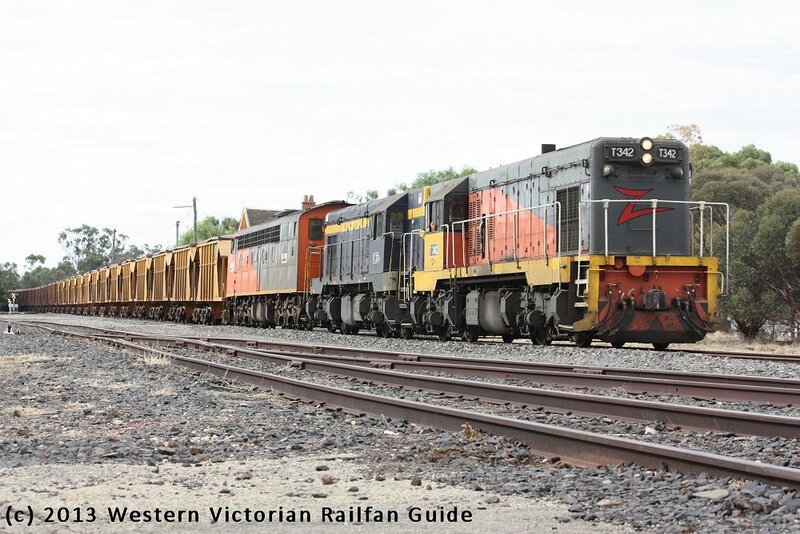 Pacific National hauled trains continue to move mineral sands from Hopetoun to Hamilton for processing, with the BL, G and 81 classes having all had stints recently as the motive power. 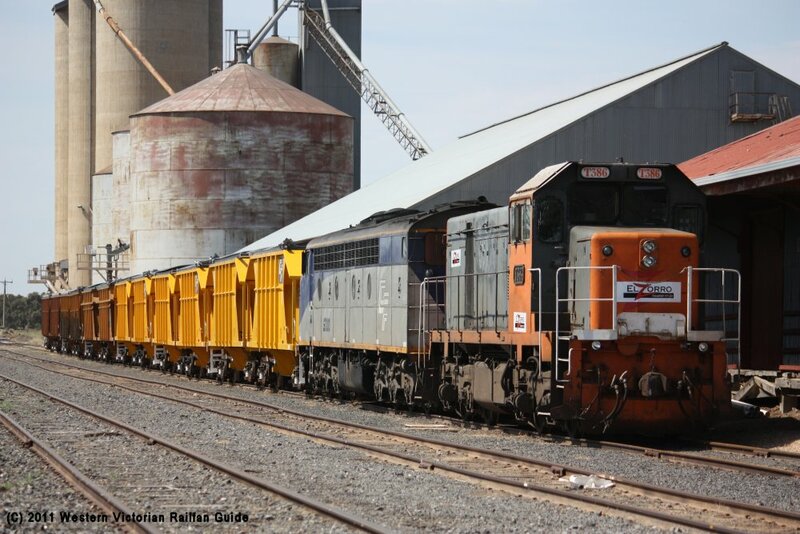 The Hopetoun to Hamilton mineral sands trains resumed in late May and as expected Pacific National took over as the new operator. Locomotives G536 and G531 combined to haul the same rake of hoppers leased from CFCLA as the previous operator used when they departed Hopetoun with their first loaded train at 11 20 on the morning of Mon.27.5.2013. Since then the service has been operating regularly with the only obvious change, apart from the motive power, being the regular trips to Melbourne every couple of weeks to service the locomotives and rolling stock instead of undertaking this in Portland as El Zorro did. The first Pacific National hauled mineral sands train soon after departing Hopetoun. With Iluka announcing in early May (through an advertisement in the Hopetoun Courier on Thurs.2.5.2013) that the haulage of mineral sands by rail from Hopetoun to Hamilton has been temporarily suspended and the rumours of an impending change of operator, the last El Zorro hauled service may have run on Sat 20.4.2013. Locomotive troubles during the preceding week had resulted in a number of different motive power combinations culminating in this unique grouping of S320-T333-TL152-1872 for the last two journeys to date. The previous Sunday the train departed Hopetoun with T342-T333-S302 up front but was obviously having some problems as it took over an hour to make it to Beulah were it paused briefly for the drivers to inspect the locomotives. Eventually the train made it to Warracknabeal where it stabled for the night to await attention from mechanics the following day. This was the first time that it was stabled at this location with the previous few occasions when it remained on the branch overnight it was at the terminus of Hopetoun. The train departed in the afternoon of Mon.15.4 but with only half of the hoppers, with the remaining ones being collected by the up service on the following Friday. The services on the Wednesday and the Thursday were both hauled by TL152 and T333 with the shortened rake of hoppers. The rumours of this train�s future suggest that it will resume in late May or early June but with Pacific National taking over the hook and pull service. These rumours were supported by the report of two G class locomotives, G536 and G537, being transferred from PN Intermodal to PN Bulk in mid-May � Only time will tell. 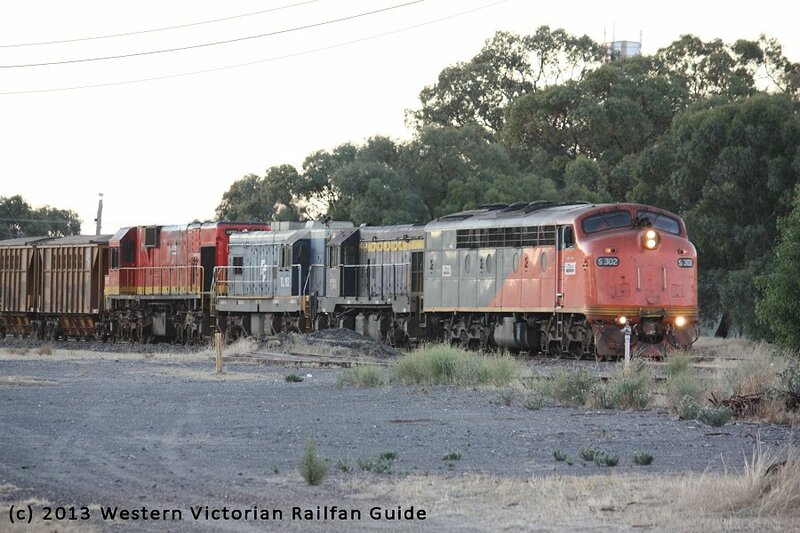 Our photographer was able to snap this quick record shot just on sunset on that day as the loaded up train passed through Warracknabeal. After a couple of weeks of back to back S class motive power, Sunday the 14th of April saw S312 replaced by two T class units. 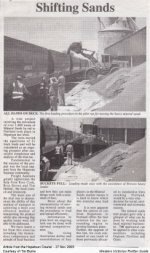 The train was sighted departing Hopetoun at 13 34 that afternoon for the trip back to Hamilton behind T342-T333-S302, but they soon encountered problems with one or more of the locomotives and the train limped into Warracknabeal late in the afternoon where it stabled for the night to await repairs. The following appeared in the minutes of the Yarriambiack Shire Council meeting held on the 10 of April 2013. Iluka did not operate trains from Hopetoun for a two week period from 9 March 2013. Nomineral sands were transported to Hamilton by road either. The mineral separation plant at Hamilton had no storage capacity during that period as it is only operating every alternative month in 2013. Trains recommenced 25 March 2013 and are operating on a daily basis. 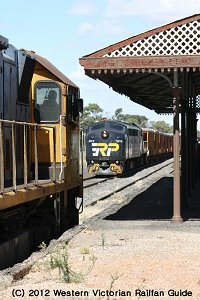 After a two week break, the Hopetoun - Hamilton mineral sands trains resumed on Mon.25.3 with the double bulldog combination of S302 and S312. Since the recommencement of these trains for the year in mid January, they have been hauled exclusively by double 'bulldog' combinations of GM36 with either S302 or S312. The Hopetoun - Hamilton mineral sands trains are having a break for the first two weeks of January, but they are expected to recommence in the middle of the month. 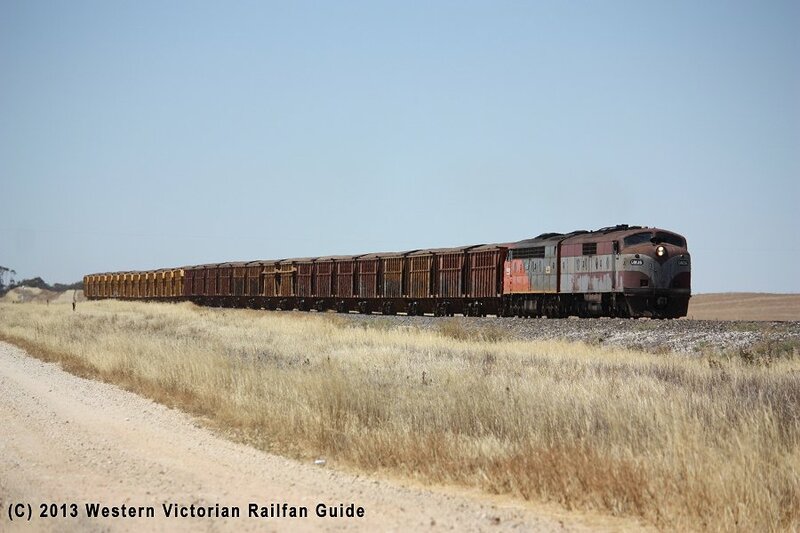 As predicted by some, locomotive 1872 only spent a couple of days on the Hopetoun-Hamilton mineral sands trains before it was replaced, althuogh it is not known if it was removed due to failure. Towards the end of the month the regular motive power combination of S302 and T386 had been replaces by S312-T333-442s2. Two trains at Hopetoun (Vic). A late running El Zorro mineral sands train hauled by 442s2-T386-S302 has just arrived to hare the yard with Pacific National's XR559 and XR555 on a grain train at midday on Wed.14.11.2012. For the last three weeks of October and into the first week of November the Mineral Sands trains were hauled by S302 and T386 north of Glenorchy and were assisted between Hamilton and Glenorchy by another unit, usually L277. There were reports early in October of C501 assisting as far as Murtoa. 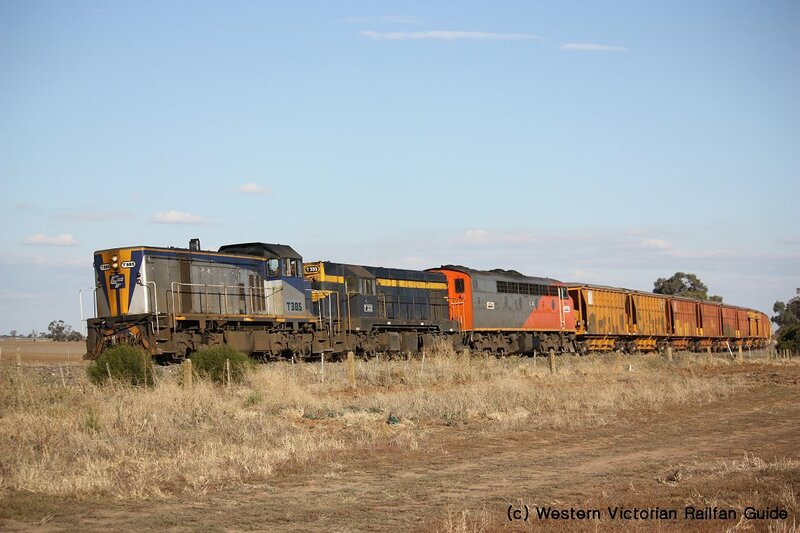 The afternoon of Wednesday the 21st of March saw the relatively unusual occurance of a cross at Warracknabeal, on the Murtoa to Hopetoun branch, between the down El Zorro mineral sands train to Hopetoun and an up loaded Pacific National grain train from Beulah. S312 and T385 pulling into the loop at Warracknabeal to cross XR559 and XR555 on an up loaded grain service from Beulah. The first Hopetoun to Hamilton mineral sands train operated on Mon.23.1.2012, with the empty down train arriving into Hopetoun at 16 45 as S302 and S312 hauling 13 sets of two permenantly coupled hoppers, for 26 individual hoppers. 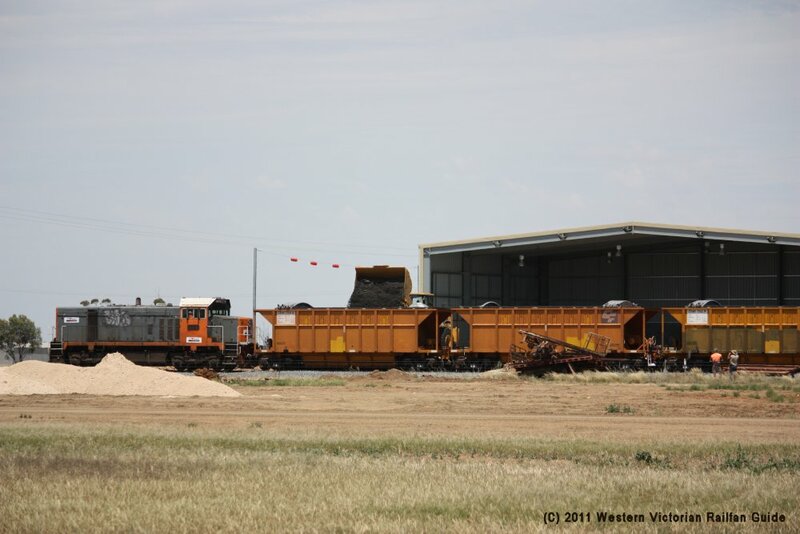 Upon arrival, four of the hoppers pairs were shunted into number two road and the locos then ran around the train and propelled the remaining nine wagons back into the Iluka loading site, and by 17 30 the loading had begun with two large front end loaders. S302 and S312 leading the first down empty mineral sands train to Hopetoun on the afternoon of Monday the 23rd of Januray, photographed at Gulaquill just south of Beulah. A mineral sands train consisting of locomotives T386 and S300 and six pairs of wagons (made up of three pairs of CHEY and three of CHBY wagons for a total of twelve hoppers) was stabled in the yard at Hopetoun on the morning of Fri.18.Nov, having travelled up from Portland the evening before. Around midday the locos were run around the train and the T was used to propel the hoppers back into the Iluka siding whilst the S was left idling at the up end of the siding. 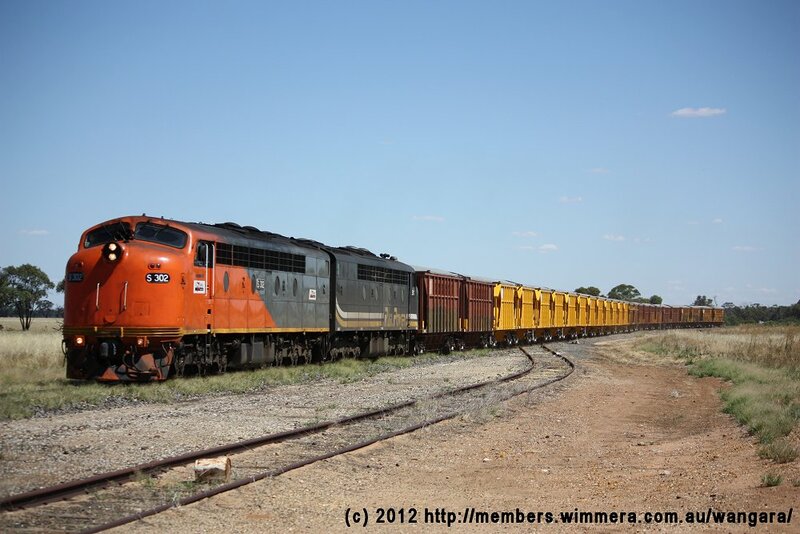 T386 and S300 with a rake of hoppers stabled in the silo road at Hopetoun on the morning of Fri.18.Nov. T386 propelling the train into the Iluka siding ready for loading. A front end loader being used to load the first hopper. 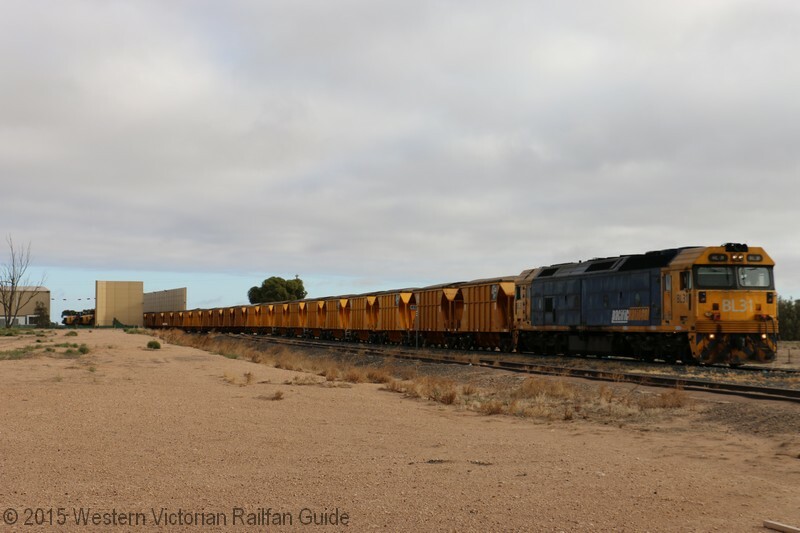 This train was a test train operated by El Zorro in preparation for the commencement of mineral sands haulage from Hopetoun to Hamilton later this year. In late 2003 a test train ran from Hopetoun to Portland as a trial for the transportation of Mineral Sands.